The Multi-Level Capacitor has four model levels. As the level increases, additional parasitic circuit elements are added. 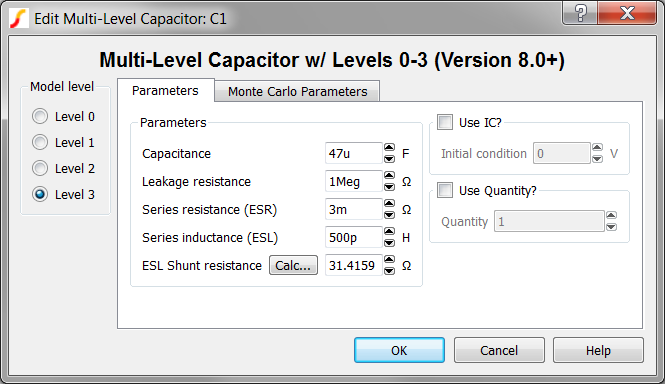 This capacitor, available with Version 8.0 or later, is used to model a wide variety of capacitor types where the number and type of parasitic circuit elements can be configured. 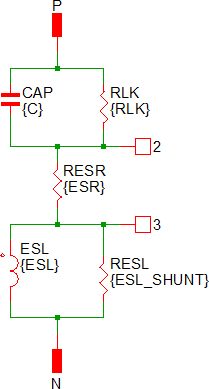 ESL Shunt resistance 3 Ω The shunt resistance in parallel with the ESL. This resistance is included to limit the maximum frequency response of the parasitic ESL, which maximizes the simulation speed in SIMPLIS mode. Click Calc... to calculate this value. 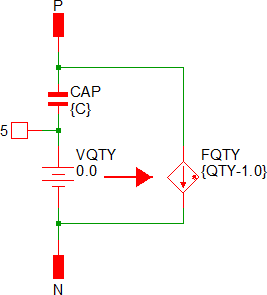 If unchecked, the capacitor initial condition is an open circuit. Use Quantity? 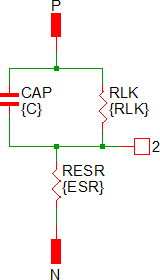 all n/a If checked, the model uses the specified Quantity of capacitors in parallel. Quantity all n/a Number of capacitors in parallel. 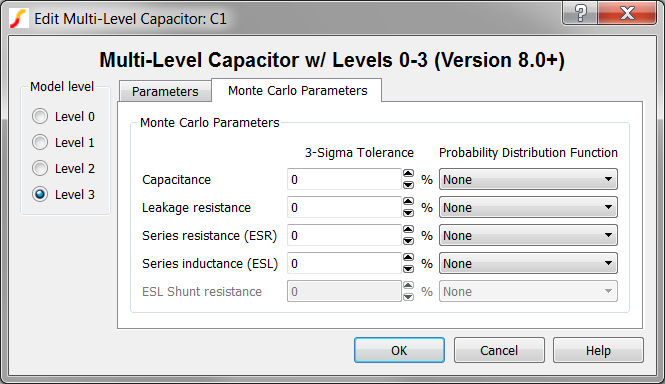 Click on the Monte Carlo Parameters tab. None The parameter has no tolerance and the value is fixed for Monte Carlo simulations. Gauss The parameter has a Gaussian distribution with the specified 3 sigma tolerance. Can return values greater than or less than the 3 sigma tolerance. Truncated Gauss As with Gauss but truncates all values outside the +/- 3 sigma tolerance. Uniform The parameter has a Uniform distribution within the specified 3 sigma tolerance. 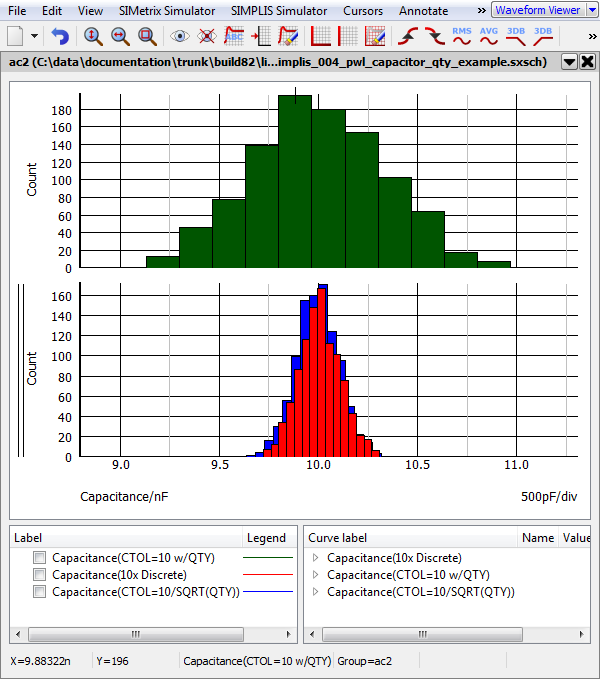 Worst Case The parameter has random values at the nominal value +/- the specified 3 sigma tolerance. The Multi-Level capacitor has four levels: 0, 1, 2, and 3. As the model level increases, additional parasitic circuit elements are added to the model. The Multi-Level Capacitor model has two quantity parameters, USE_QTY and QTY, which specify the number of capacitors in parallel. Configuring these parameters minimizes the number of reactive circuit elements in the model and, therefore, provides a maximum simulation speed.